Flake blend epoxy adds texture and color to floors by incorporating multi-colored flakes into the epoxy resin mixture. The flakes can either be of synthetic or natural mineral origin. Sizes are also available for coarser and finer textures as well as a wide array of color blends. 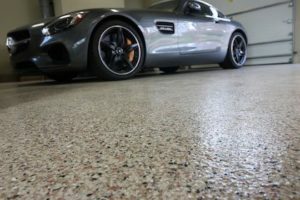 Depending on the design and application technique applied, flake blend epoxy can also achieve natural granite or Terrazzo. The look of flake blend epoxy naturally complements formal environments like office spaces, academic establishments, and banks. Even so, the texture and color of flake bend epoxy can be customized to match the ambiance of showrooms and automotive establishments. Metallic epoxy is the preferred option for those who want a distinctly unique look for their floors. 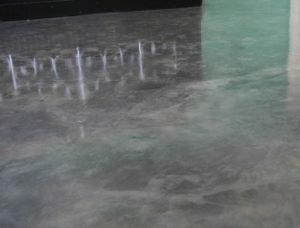 The visual effects achieved through metallic epoxy varies depending on the installer’s application technique and the look of the concrete floor itself. To achieve the metallic look, a fine shimmering pigment is blended into the epoxy resin mixture to add color and a glistening effect. Visual effects like swirls, craters, ripples and the look of plasma can be made to add movement and dimension. Metallic epoxy is ideal for environments that celebrate artistic expressions like museums and art galleries. These are also ideal for adding an elegant accent in spas, restaurants and luxury hotels. 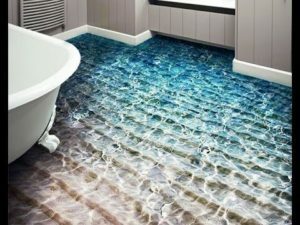 3D epoxy is an incredibly bold design choice installed to create eye-popping floors. How so? A graphic image is adhered to the bare floor and then poured over with a clear epoxy resin to create a 3-dimensional effect. The result is a realistic scenery that seems to be popping up from right underneath your feet. You can get ambitiously creative with the images you choose. The sky is literally the limit with this type of epoxy flooring. 3D epoxy floors add a striking whimsical scene to commercial areas that demand the attention of customers. Recreational establishments like malls, theme parks, resorts and other areas of amusement will surely benefit from this eye-catching flooring. For more details on epoxy floor installations or other decorative concrete services, visit our webpage to learn more.